Turn up your speakers to hear the video. click play again to resume. This will help the video play evenly on a slow connection. 20 DVD lessons that cover everything from how to use your aids to the training scale to all the movements and exercises from Training level through Third level. PLUS 3 bonus DVDs that cover some of the mental aspects of riding like exercises to help you relax, using visualization and self-talk to improve your skills, using music to help you with rhythm and tempo…and to have FUN! 20 CD lectures that cover the same material in the DVD lessons. Pop them in your CD player in your car or your Walkman when you’re exercising. The lectures reinforce everything you see in the DVDs. A BONUS CD on Problem Solving with the tools you’ve learned in the lessons. A 135-page manual that summarizes the lessons in a quick and easy Question and Answer, bullet point format. The manual also includes space for notes and a fill in the blank section to really be sure you absorb the main points. A Winning Attitude book to help you get your ride and your day off to a great start. In this module, you’ll learn how to develop a non-verbal language with your horse so that you can communicate more effectively. First, you’ll learn how to break down the individual aids (seat, legs and hands) so you can teach your horse the A, B, C’s of your new language. Later, you’ll combine the individual letters of the alphabet together to form words such as “canter depart” or “on the bit”, or “go sideways”. How Do I Teach My Horse to Go Forward? What Are the Aids to “Go”? How Do I Use Each of the Driving Aids? What Are the Aids to “Whoa” or Slow Down? What Does Each Aid Control? How Do I Use the Aids to Get a Specific Response? How Do I Put the Letters Together to Form “Words” or Movements? Why Do Riders Forget to Use the Outside Rein? Are There Some Exercises That Will Help Me Learn to Use My Outside Rein? There’s a lot of confusion and conflicting information when it comes to horse training. But one thing most horsemen agree on is that the Training Scale is your guideline for training and problem solving. What Is the Training Scale? What are the Six Ingredients in the Training Scale? When Would I Adjust My Horse’s Tempo? What Parts of My Horse’s Body Need to be Supple and Loose? How Do I Use My Aids to Supple My Horse’s Neck? What is the Sequence of Aids for Suppling My Horse’s Neck? What are Some Exercises to Supple My Horse’s Shoulders? What Kind of Bit Should I Use? What Are the 5 Qualities of an Inviting Contact? What Are the Five Rein Effects? What is the “Work Area”? What is a Half Halt? What Do I Need to Know About Connecting Half Halts? What’s the Order of the Aids For a Connecting Half Halt? How Do I Teach My Horse the Connecting Half Halt? How Do I Know If My Horse is Honestly on the Bit? What Should I Do If The Half Halt Isn’t Going through 100%? How Often Should I Give Connecting Half Halts? How Do I Keep My Horse on the Bit During Transitions and Movements? Does the Connecting Half Halt Ever Last More than 3 Seconds? Is the Connecting Half Halt Ever Shorter Than 3 Seconds? What Do I Do if My Connecting Half Halt Isn’t Working? Is There More Than One “Kind” of Straightness? How Can I Use First Position to Strengthen My Horse? What Should I Do If I’m Having Trouble Getting First Position When My Horse’s Hollow Side is on the Inside? Why Do I Want to Collect My Horse? Why is it a Challenge to Collect a Horse? How Can I Tell If My Horse is Truly Collected? When Do I Start Collecting My Horse? What’s the Difference Between Connection and Collection? How Do I Collect My Horse? How Do I Know When My Horse is Ready to Start the Advanced Lateral Exercises? How do I Teach My Horse Collecting Half Halts? What Do I Do if My Horse Ignores the Collecting Half Halt? Have I Collected My Horse if He Takes Shorter Strides? Your horse needs to be supple both laterally as well as longitudinally. In this module, you’ll learn how to promote lateral suppleness (bend) by riding school figures and turns accurately. Why Must Circles Be Ridden Accurately? What Do I Need to Know to Ride an Accurate Circle? What are the Bending Aids? How Do I Know Which is the Inside or Outside of My Horse’s Body? How Do I Mark Off an Arena If I Ride in a Field? What are the Reference Points for a 20-meter Circle? What Do I Need to Know About Corners? How Do I Make My Horse More Ambidextrous? How Do I Use “Benign Antagonism” to Help My Horse Become More Ambidextrous? How Do I Make the Hollow Side “Stiffer”? How Do I Make the Stiff Side “Softer”? How Do I Ride a Serpentine? How Do I Ride a Shallow Loop? How Do I Turn On and Off the Centerline or Do Turns Across the School? Your horse should also be supple longitudinally which means he can smoothly adjust his carriage or outline without interrupting the flow of his movement or balance. Transitions from gait to gait as well as transitions within the gait are two of the best ways to develop longitudinal suppleness. What Are the Aids for Upward Transitions? What Are the Aids for Downward Transitions? How Do I Teach My Horse to Respond to the “Stilled” Seat? What Do I Do If My Horse Doesn’t Listen to My Back and Voice? How Do I Know If I’m Using My Stilled Seat Correctly? What Do I Do If My Horse Comes Off the Bit During Transitions? What Else Do I Need to Know to Do Good Transitions? What Is a Working Gait? When Do I Start Lengthenings? What Happens During a Lengthening? What’s the Difference Between a Lengthening and a Medium or Extended Gait? What Determines Whether or Not My Horse Does a Good Lengthening? How Do I Create Engagement Before the Lengthening? What Are the Aids for a Lengthening? Do I Ask for Lengthenings in the Walk? How Do I Help My Horse Keep the Same Rhythm and Tempo? When is the Contact Too Heavy? Is There Anything Special I Should Do With My Position? What Are Some Good Images to Have in My Mind? This module focuses on an introduction to teaching your horse to go sideways starting with the turn on the forehand and leg yielding. These exercises not only teach your horse to be obedient to the leg, but also create many other desirable gymnastic qualities. In the lesson on leg yielding, you’ll learn how to use variations of this exercise for its loosening, stretching, toe-touching benefits. What are the Pros and Cons of the Turn on the Forehand? How Do I Start the Turn on the Forehand? What are the Aids for Turn on the Forehand and Leg Yielding? What’s the Difference Between Leg Yielding and the Other Lateral Exercises? What are the Pros and Cons of Leg Yielding? What are the Patterns and Places in the Arena for Leg Yielding? If I’m in Rising Trot, Which Diagonal Should I Post On? What Do I Do If My Horse Doesn’t Move Sideways Willingly? Why is It So Important For Me to Keep My Horse’s Neck Straight? What Do I Do If My Horse Loses Activity? Why Is It So Important to Ride to Specific Markers? Can I Use Leg Yielding to Solve Some Common Problems? As you continue to educate your horse, you’ll start to ask him to go sideways while he bends through his body. As a result of going sideways with bend in shoulder-in, haunches-in, turn on the haunches, and half pass, you’ll be able to collect your horse and shift his center of gravity toward his hind legs. How Do the Advanced Lateral Exercises Differ From Leg Yields? How Many “Tracks” Are There in Lateral Exercises? How Do I Decide Which Gait to Use When I Start Shoulder-In? What’s the Difference Between First Position, Shoulder-Fore, and Shoulder-In? How Do I Start Shoulder-In? How Can I Tell If My Horse is Doing a High Quality Shoulder-in? What’s the Order of the Aids? What Do I Do If My Horse’s Rhythm or Tempo Changes? What Do I Do If My Horse Loses the Bend? How Do I Get More Control over the Angle? What Should I Do If I Have Trouble Controlling the Shoulders and End Up with a “Head and Neck-in” rather than a Shoulder-in? Why Am I Tempted to Use an Indirect Inside Rein? What Should I Do If My Horse’s Shoulders Feel “Glued” to the Rail? What’s the Difference Between Haunches-In and a Crooked Horse? What Do I Do If My Horse Loses the Angle? What is a Turn on the Haunches? What Are the Aids for a Turn on the Haunches? What is the Sequence of Aids for a Turn on the Haunches? How Should I Introduce Turn on the Haunches? How Do I Know If I’ve Lost Bend? What Do I Do If My Horse Loses His Rhythm? What Do I Do If My Horse Gets Nervous? What Do I Do If My Horse Loses His Desire to Go Forward? How Do I Know If I’m Using the Aids Correctly? How Do I Control the Hind Legs? What Else Can I Use Turn On the Haunches For? What Are the Aids for a Half Pass to the Left? What is the Sequence of Aids for a Half Pass to the Left? What Do I Do If My Horse Loses Impulsion? What Do I Do If My Horse’s Tempo Is Either Too Fast or Too Slow? How Do I Know If I’m Doing a Half Pass With Good Engagement? A horse that is obedient and moves in good balance is a pleasure to ride. This module contains exercises that help promote both of these qualities. Learn the correct aids and some trouble-shooting techniques for exercises from a simple reinback to counter canter to the more advanced flying change. What Does a Good Reinback Look Like? What are the Aids for Reinback? How Do I Start Teaching My Horse to Reinback? What Should I Do if My Horse Doesn’t Back Up Correctly? What Do You Mean By “Collecting Half Halts”? What Should I Do If My Horse Doesn’t Change Both His Front and Hind Legs? What If My Horse Doesn’t Change at All? What Should I Do If My Horse is Crooked in the Flying Change? BONUS MODULE 8—IT’S ALL ABOUT YOU! Even though it’s essential to have a clear-cut, systematic approach to training, you’re as much a part of the Happy Horse equation as your horse is. In this bonus module, you’ll learn how to use music to establish good rhythm and tempo as well as how to do some “off your horse” homework to improve relaxation and confidence. Pick music that suggests different movements like transitions or medium gaits. Pick music that suits both you and your horse’s type. Ride to music to just plain have FUN! 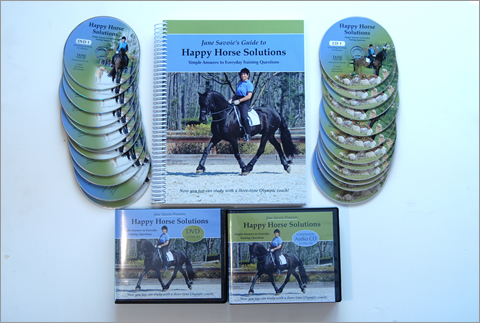 And here’s what you’ll find in the companion Happy Horse Solutions. 12 CD lectures that cover the same material in the DVD lessons. These audio lessons reinforce what you’ve learned in the DVDs. 133 page manual with illustrations that summarizes the lessons in a simple format to help you wrap your brain around the techniques. In this module, you’ll learn about the qualities that make up good walk, trot and canter, the differences between the various walks, trots, and canters, and how to fix common problems that come up in each of the gaits. In this module, you’ll learn how to help your horse become more athletic through suppling exercises, bending exercises, rubber band exercises, and modifications of traditional leg yielding. How to make the tempo (speed) faster or slower? How to modify “traditional” leg yielding to improve the stiff side. Riding your horse on the bit and in good balance insures that all of the exercises and movements you do with your horse are more beneficial. That is, transitions on the bit create more suppleness than transitions not done on the bit, and leg yields ridden on the bit create better suppleness than leg yields not done on the bit. Once you can offer your horse an inviting contact and can put him on the bit, you can create even greater gymnastic benefits through timing your aids correctly and collecting your horse. This bonus lesson on flying changes gives you all the problem solving information you need to know to teach your horse how to do clean flying changes. You can see that the material in the courses easily adds up to a whopping $7,200! But you won’t have to pay anything near that kind of money. And if all that knowledge can help you avoid JUST ONE TRAINING MISTAKE OR FRUSTRATION while training your horse…it will pay for itself many times over. But, I get it. Even though this kind of education is offered at the amazing value of $997, it’s not a drop in the bucket. But there’s no faster more affordable way to get the kind of training that can help you avoid years of training your horse the wrong way. And I do realize in these economic times that you might not want to invest in the entire course all at once. However, I definitely don’t want you miss out. So I’m making it even easier for you by offering a 3-payment installment plan of just $365 each. I want you to feel totally comfortable investing in the courses, so I’m offering a 30-day money back guarantee. If you’re not completely satisfied, return the courses to me for a full refund…No questions asked. BONUS #1 — How Do I Handle My Horse’s Resistance? This 56 Minute downloadable audio includes guidelines for uncovering physical sources of discomfort, help for your riding position, and learning how to decrease resistance by introducing new work in “ridiculously small baby steps”. In this 35 minute downloadable audio, Jane not only gives you simple exercises to supple your horse’s body, but also gives you clear ways to test if you’ve successfully suppled your horse. In this 53 minute downloadable audio, Jane explains the subtle differences in the meaning of the seemingly simple words “Forward” and “Straight”. She discusses both the physical and mental aspects of going forward. She also describes how to easily straighten your horse through his body as well as ride him in “First Position” so he learns how to engage his hind legs. It seems like one of the biggest dilemmas is how to put your horse on the bit, and keep him there. Fortunately, it doesn’t have to be that way. My new ebook 101 Tips For Riding Your Horse On the Bit demystifies the process of putting your horse on the bit. This fun ebook lets you look at life from Moshi (my Friesian), and Indy’s (my Golden Retriever) point of view. Their insights and life lessons are fun and uplifting! What are the correct aids for the canter? What if I can’t get my horse to pick up the correct lead in one direction? What do I do if my horse counter-bends during the depart? How do I keep my horse on the bit during the upward and downward transitions to and from the canter? What do I do when my horse rushes in the canter? What do I do when my horse tosses his head? How do I keep my horse relaxed in the canter? How do I keep my horse from falling on the forehand in downward transitions? How do I keep my horse from getting strong in the canter? How do I teach my horse to collect in the canter? What do I do if my horse swaps leads when I try to ride him in shoulder-fore? BONUS #10 — That Winning Feeling! Encompassing the areas of dressage, eventing, and show jumping, 1992 U.S. Olympic dressage squad member Jane Savoie presents a revolutionary approach to riding by which you can train your mind and shape your attitudes to achieve higher levels of skill than every imagined. (Shipped with your product). – Joelene Morris “Joe” H., New Mexico.